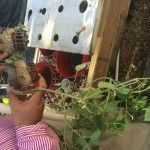 Sahib Aquaponics – What’s Eating My Plant Roots? 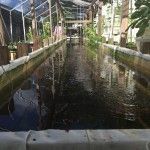 As we entered summer here in Central Florida, I started to notice stunned growth in the Deep Water Culture (DWC), rafts of a number of the leafy greens that normally grow well in the heat. The Mint was growing leaps and bounds but the Basil plants looked weak and small compared to previous years. The Swiss Chard plants also started to have stunted growth. I performed all the usual water checks and confirmed that all was in order. The pH balance was around 7. Nitrates and Nitrates were where they were supposed to be and the plants were not showing any major nutrient deficiencies. Still I added a little Chelated Iron and a cap or two of Maxicrop with Iron. Let’s see if it is because of the stormy weather we have been having. Well the situation did not improve, it got worse! 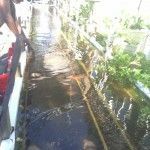 I knew that there was a faint possibility that perhaps some Tilapia had escaped or found there way into the DWC and were having a field day with the roots. I honestly did not want to believe that as I had done a major purge last year and introduced screens on return water pipes. 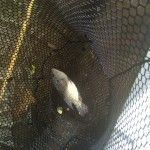 I had found almost 40 Tilapia then (2 inches to 6 inches), and honestly thought that the issue has been solved. 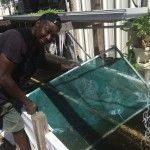 Last year I had failed to place screens on the return water pipes from the Tilapia breeding tanks (tied to my overall Aquaponics system in Phase 1 so as to provide a larger volume of water to encourage the Tilapia to breed). One hot afternoon as I was checking the breeding tanks and the fish I noticed lots of little black fry and saw that the filter on the return outlet from the tank had been knocked off allowing the fry to be swept to the DWC. 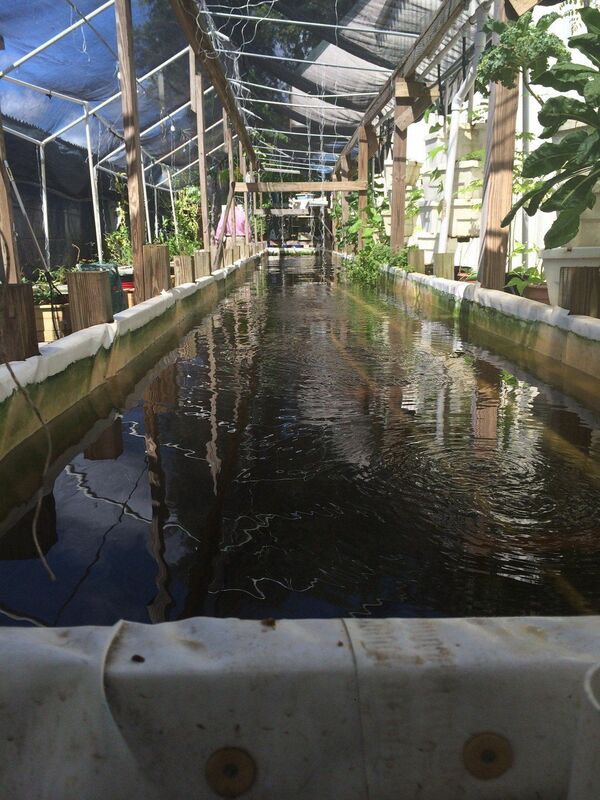 I waited a couple of weeks and then worked with friends to drain the DWC and fish out the small Tilapia fish. I thought we had done a thorough job and had caught all the Tilapia. 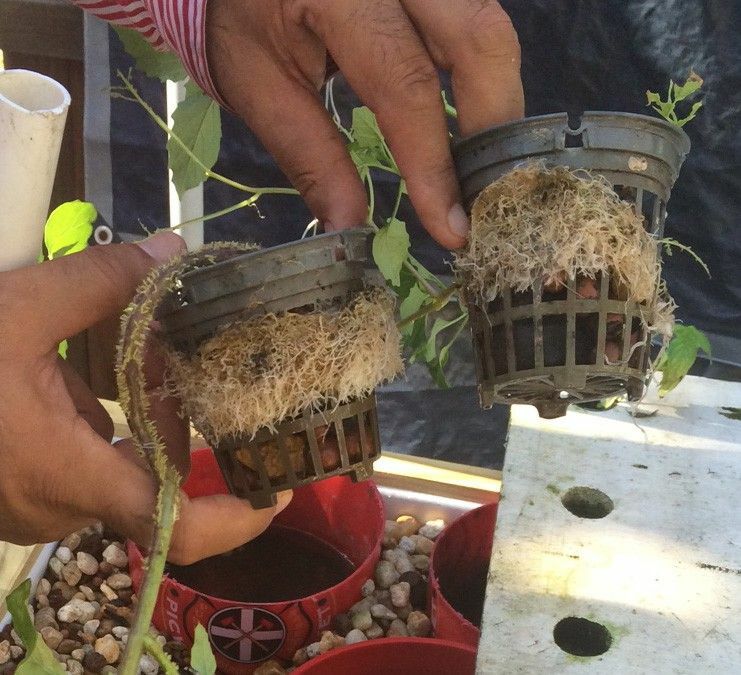 Last month I pulled out a few net pots and was shocked to see severe root damage. 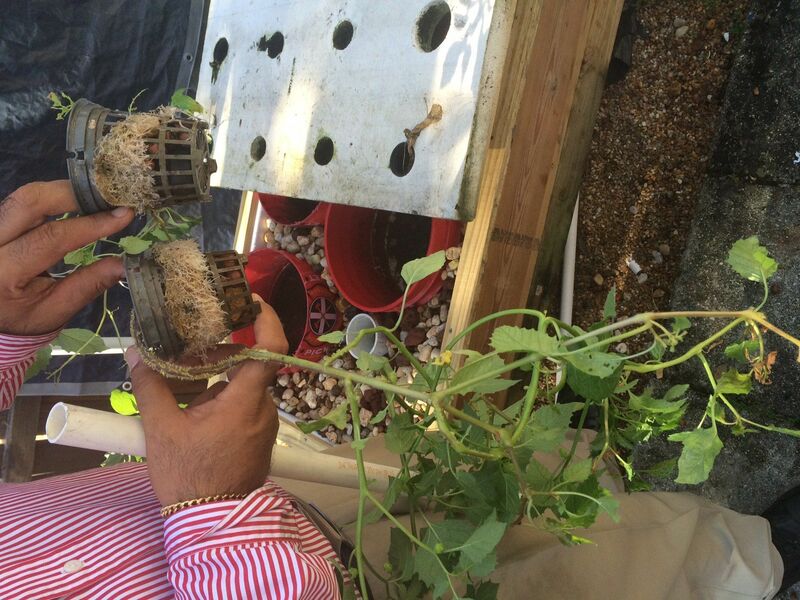 What amazed me is that in the 3 inch net pots, there were no roots left on the Tomatillo vines (see picture). 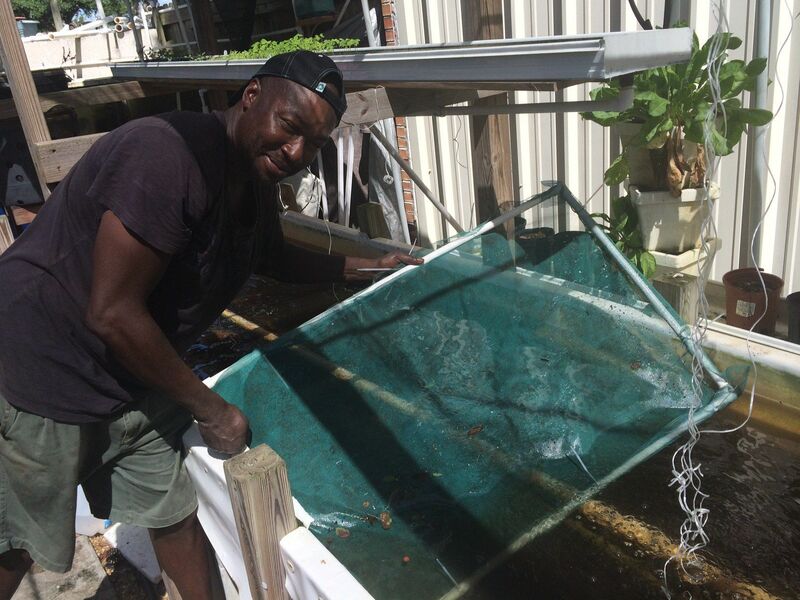 Well now I was convinced that perhaps I had not removed all the Tilapia – so today along with one of our Interns and helpers I decided to “go Fishing”. I removed all the rafts and started to drain the water to storage tanks. No one really believed me when I said that there was ”something eating the plant roots”. There’s nothing here Sahib? Really! I designed a Fish Net Screen and one of my helpers along with one of our Interns started a systematic sweep of the DWC. About 10 minutes later, “Got it!” There was a 12 inch or so Tilapia hiding behind the floating Mint. We checked the rest of the DWC and did not find any other fish. 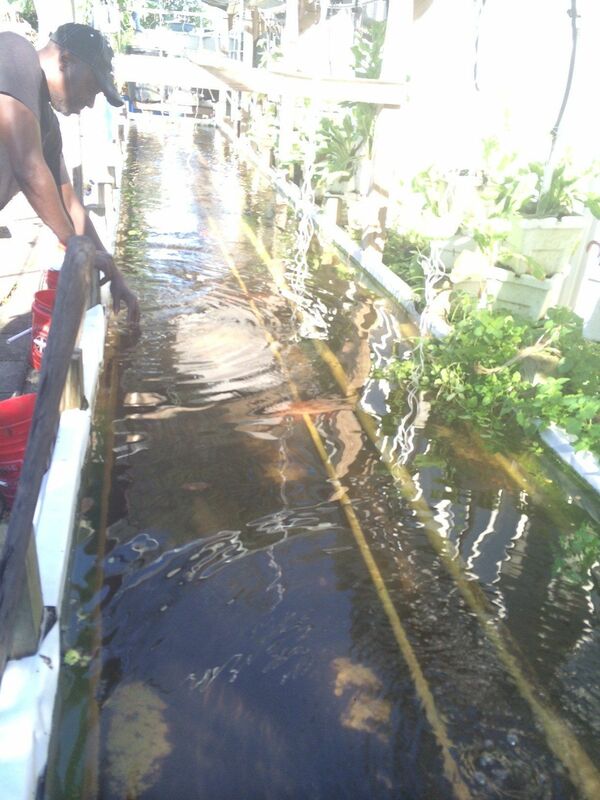 Well we found what was eating the plant roots…one big Tilapia almost plate size. 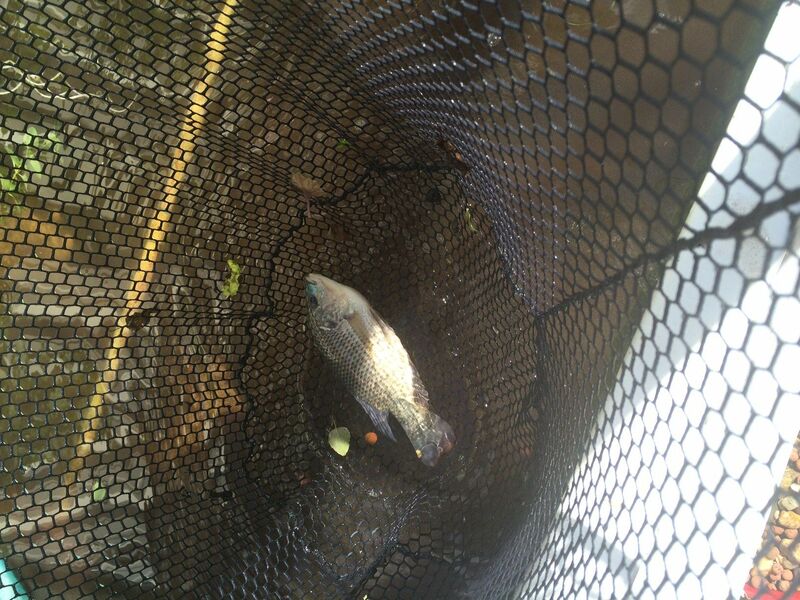 Lucky for this Tilapia that we decided to let him live and added him with the Koi.